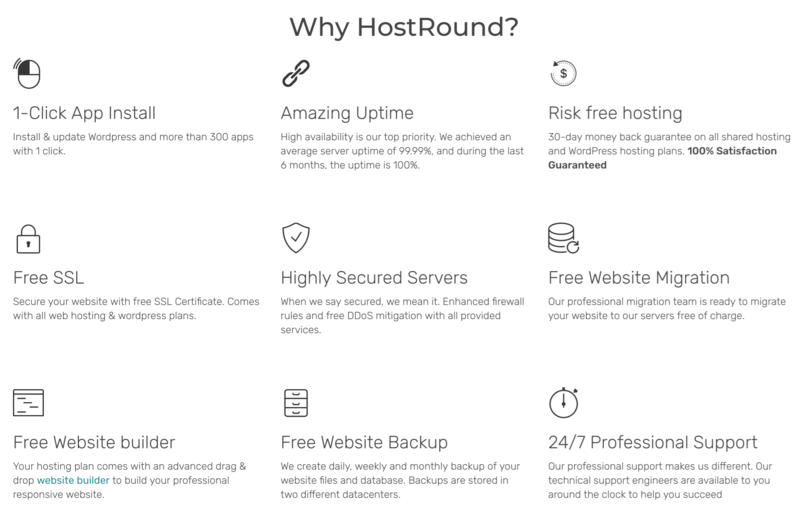 HostRound Review 2019: Is HostRound a Good Hosting? Web hosting company HostRound is based in Dover, Delaware. It offers shared web hosting, WordPress hosting, VPS hosting, reseller hosting, cloud servers, and dedicated servers along with domain registration and transfer solutions. HostRound is a relatively new hosting company that started its journey in 2016. Although popular for its WordPress hosting solutions, its range of services also includes web hosting, reseller hosting, VPS hosting, cloud servers, and dedicated servers. It also offers domain registration and transfer solutions, SSL certificates, and software licenses (for Softaculous VPS and Softaculous Dedicated). HostRound has five data centers: four in the U.S. (Dallas, Washington D.C., Los Angeles, and San Francisco) and one in The Netherlands (Haarlem). HostRound’s website is in English. HostRound offers 3 SSD shared web hosting plans, 3 WordPress hosting plans, 2 reseller hosting plans, 6 cloud servers, 13 dedicated servers, and 6 VPS hosting plans. While the Basic web hosting plan is suitable for websites with 10,000 visitors per month, the medium-performance Pro and high-performance Ultimate plans are better for websites with 25,000 and 100,000 monthly visitors respectively. These three plans differ in terms of SSD disk space (7 GB to unlimited), bandwidth (250 GB to unlimited), and the number of domains/websites (5 to unlimited). Beginner webmasters will benefit from an advanced drag-and-drop website builder that allows you to create a professional, responsive website without any design or programming skills. And the one-click app installer can be used to install WordPress and 300+ other apps. For e-commerce features, you can use the website builder’s shopping cart module that supports PayPal payments by default but which lets you use alternatives like Authorize.net or 2Checkout. HostRound’s data centers provide impressive uptime of 99.999% (Dallas) or 99.99% (all other centers). HostRound’s shared web hosting plans are pricey, especially on the monthly billing cycle that also incurs a setup fee. However, you can get a substantial discount of up to 45% (and possibly a free domain) by choosing a 12-, 24-, or 36-month term instead. If you’re not sure about making such a long commitment, the 30-day money-back guarantee on all shared hosting and WordPress hosting plans should give you the confidence that you can get out within the first month if you’re not entirely satisfied. All plans can be paid for in U.S. dollars via PayPal, Alipay, Bitcoin, Bitcoin Cash, Apple Pay, or credit/debit card. You can get self-support assistance from the provider’s knowledge base, and existing customers can also to check the network status. Finally, the company’s announcements page tells you what’s new. For feature-rich hosting plans backed by a 30-day money-back guarantee and an SEO-friendly website builder with e-commerce features, see what HostRound has in store for you. For feature-rich web and WordPress hosting, go to HostRound! Wondering how HostRound stacks up against other Web Hosting companies? Enter any other Web Hosting company and we will give you a side-by-side comparison.